First, pour 1 tbsp of olive oil in a large saucepan. When the oil is hot but not smoking, stir-fry the silvered almonds until they are golden brown (be careful not to burn them! 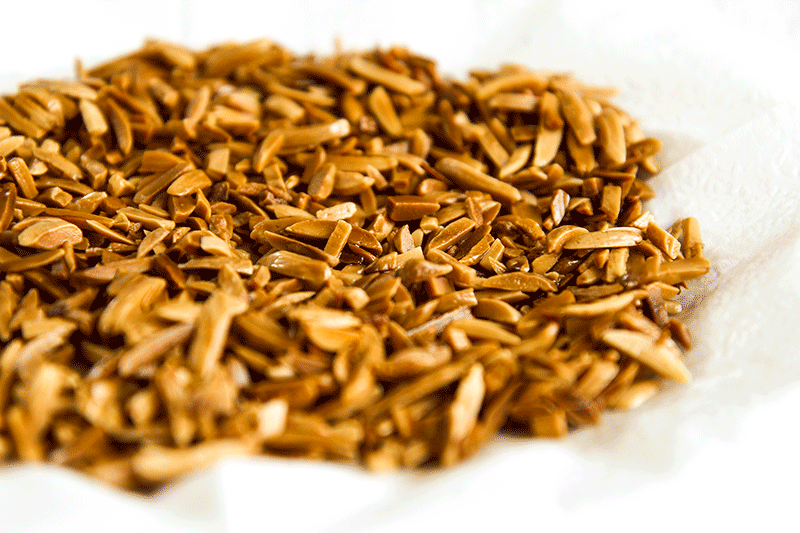 ), Then drain the almonds and let it rest on paper towels to dry the excess of oil. Add another 3 tablespoons of olive oil in the same pan and saute the cloves of garlic, peeled and crushed. When the garlic is golden brown, take out from pan and conserve it, we will use it later. 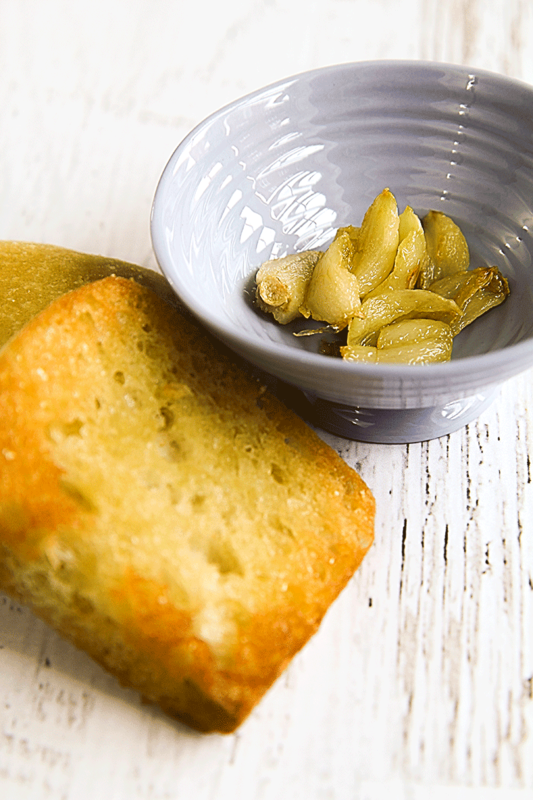 In the same oil in which we fry the garlic, fry the slices of bread until they are crispy, then we take out them and put aside. 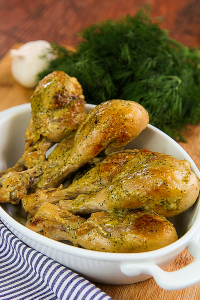 Still using the same pan, add 1 tablespoon of olive oil and roast the chicken drumsticks and thighs, a few pieces at a time. When the chicken is well browned on all its parts, take out from the pan and let it rest on paper towels. Guess what ‘? Oh, yes … we still use the same saucepan! Add a 1 tbsp of olive oil into the pan and saute the thinly sliced onion. When the onion is soft and translucent, add the diced tomatoes and the cloves. Continue cooking until the tomatoes will not begin to reduce to a mush, then reduce into dice and add the fried bread, the roasted almonds and the garlic fried before. Continue cooking until the bread becomes soft, then pour everything into a blender and mince to create the almendras sauce. 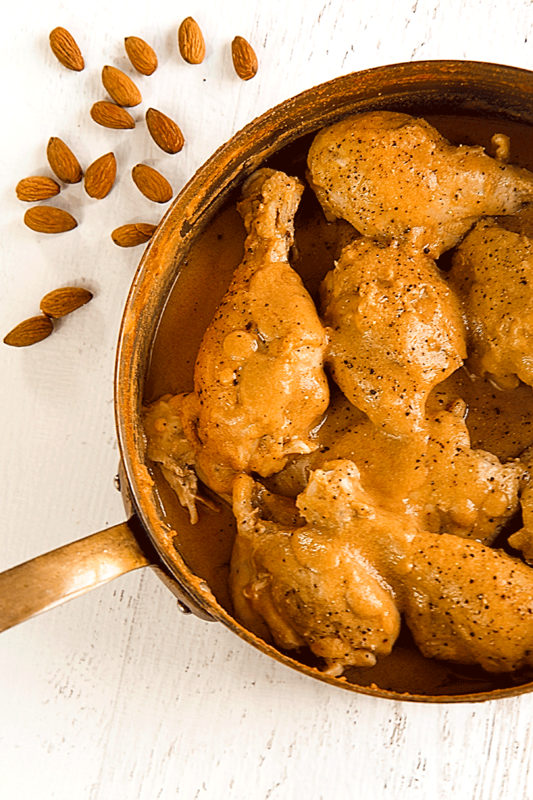 Pour the salsa de almendras into the pan, add the bay leaves and the roasted chicken drumsticks and thighs. Add the broth, enough to just cover the chicken and mix well. Cover the pan with a lid and continue to cook over low heat for 1.5 hours. After an hour and a half, the Mexican chicken in almond sauce will be ready! You can serve as it is, adding a dash of ground black pepper, or follow my personal variant, to get a more creamy sauce. Remove the chicken pieces from the pan and keep them warm, then strain the sauce through a sieve with fine patterns, using a spoon to push down the sauce. Return the sauce to the pan and mix one teaspoon of sieved cornstarch, before putting the pan on the heat. Now, cook the sauce, stirring constantly with a wooden spoon, until it thickens, then add the chicken, stir well, add the black pepper to taste and serve hot! For the “Cinco de Mayo” I desired to eat a delicious Mexican chicken (like all of us! ), but not one of the usual Mexican recipes. I wanted to find out a recipe that I had never experienced before. 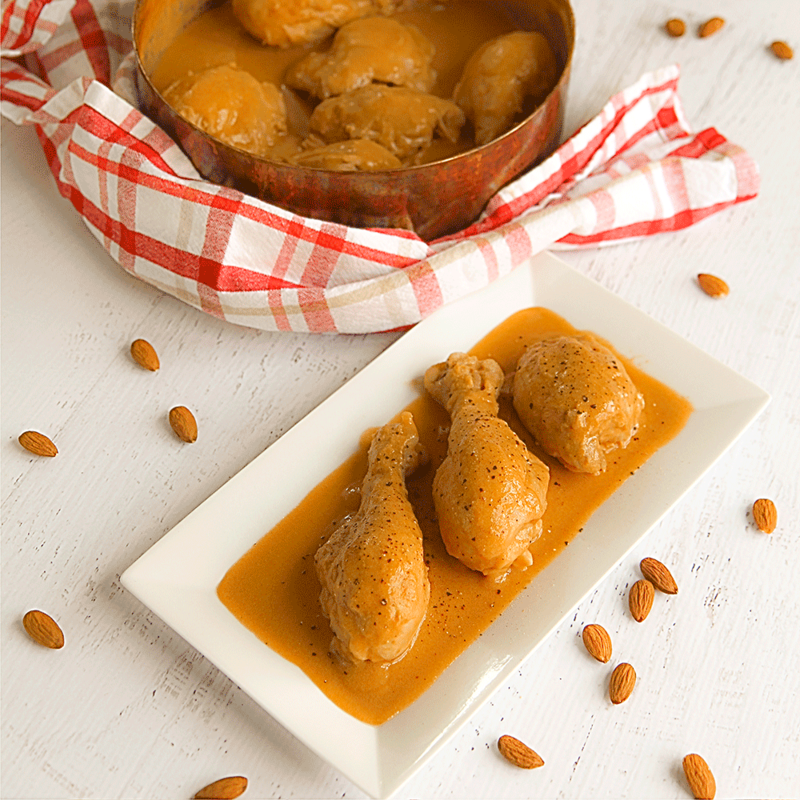 After a little 'research, I chose the chicken in “Salsa de Almendras”, a fantastic, quite unknown, recipe made with almond sauce. If you've never tried it, I highly recommend it! 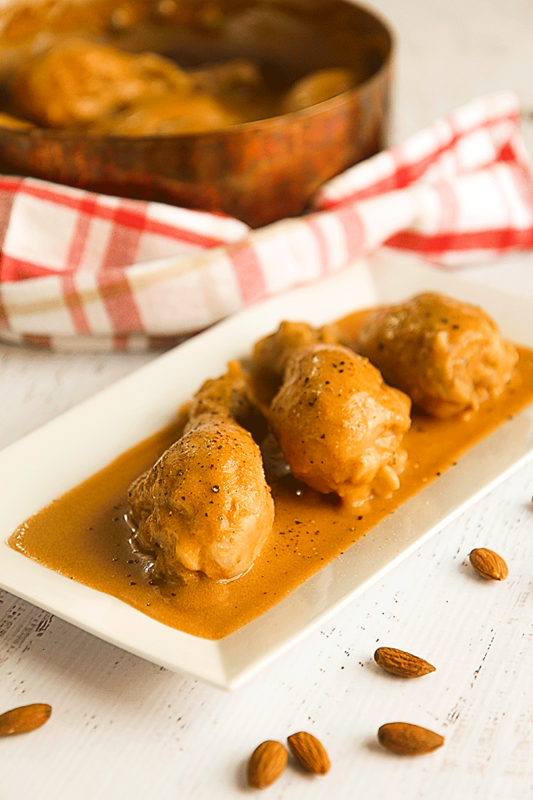 The recipe that I've written below is faithful to the original, I followed a small personal variant only finishing the dish to make the almond sauce even more creamy! Guess what '? Oh, yes ... we still use the same saucepan! Add a 1 tbsp of olive oil into the pan and saute the thinly sliced onion. When the onion is soft and translucent, add the diced tomatoes and the cloves. 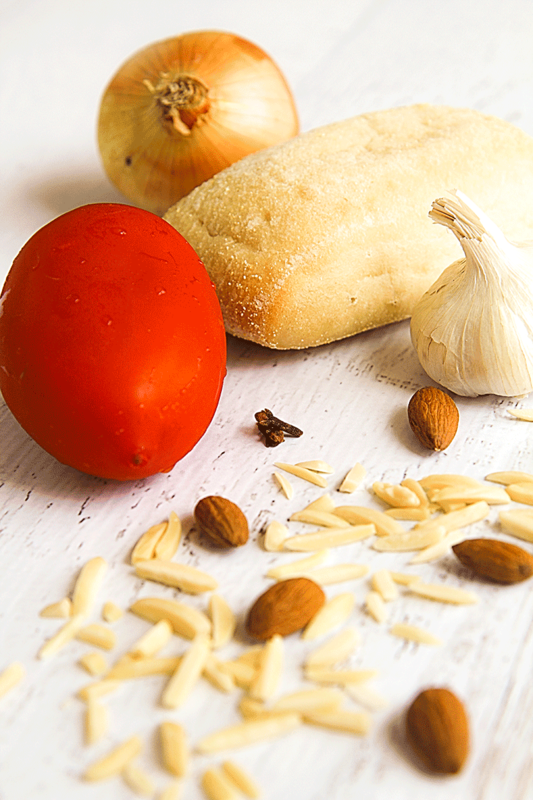 Continue cooking until the tomatoes will not begin to reduce to a mush, then reduce into dice and add the fried bread, the roasted almonds and the garlic fried before. Continue cooking until the bread becomes soft, then pour everything into a blender and mince to create the almendras sauce.